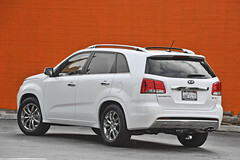 The 2012 Kia Sorento returns with a few changes from the 2011 model year. The 2011 model was all-new so a major overhaul was not expected. The Sorento is Kia’s midsize SUV model in its lineup larger than the compact Sportage. However, the model’s main competitors such as the Honda CR-V, Toyota RAV4 and Chevy Equinox largely are in the compact SUV class. The 2012 Sorento does offer Kia’s new UVO system, which is powered by Microsoft. The system is a hands-free infotainment and communications system that offers advanced voice control, color touch screen, HD radio, Bluetooth, rearview camera, among other features. The 2012 model also adds power-folding mirrors, ventilated driver’s seat, memory/power passenger seat, wood trim steering, and heated steering wheel. The Sorento is a great value with a starting MSRP of $21,250. The base 2012 Sorento with front-wheel drive comes standard with 2.4-liter 175 horsepower four-cylinder engine, essentially the same engine found in the smaller Sportage. The engine returns 20-mpg city and 27-mpg highway in front-wheel drive (FWD) with its six-speed manual transmission. The LX trim is a step up from the base and starts at $23,150 for the FWD and the all-wheel drive (AWD) trim is at $25,350. The LX adds a third-row of seats (the base Sorento does not) although they can really only accommodate small children. The LX also has a standard six-speed automatic transmission that boosts fuel economy to an impressive 22-mpg city and 32-mpg highway in FWD and 21-mpg city and 29-mpg highway with AWD. Interestingly, Sorento offers a second 2.4-liter engine but with 15 more horsepower in EX trim lines. The engine is similar to what is seen in the excellent Kia Optima. This engine is more modern but retains essentially the same fuel economy as the less powerful engine. The Sorento EX FWD has an MSRP of $25,950 and comes standard with power seats. Leather seats are an option. The Sorento offers an optional 3.5-liter 276 horsepower V6 across the LX, EX, and SX trim lines. Its fuel economy is significantly lower at 20-mpg city and 26-mpg highway in FWD trims and 18-mpg city and 24-mpg highway in AWD trims. The SX trim competes more against models such as the Ford Edge and Nissan Murano as its AWD line has an MSRP of $34,250 and leather seats and navigation being standard. 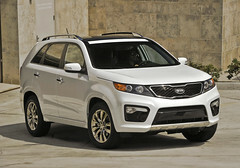 Since the new generation debuted in January 2010, the Sorento has been a big hit for Kia. Kia sold more than 100,000 Sorentos in the U.S. in 2010. With its improved stature, the popular crossover now has one of the highest residual value ratings in its class. It also offers great safety features that placed last year’s model in the list of safest 2011 SUVs. Kia hopes the changes made for the Sorento in 2012 will keep sales strong. The Sorento is assembled in West Point, Georgia. Which is your favorite 2012 SUV for under $25,000?